Their strict adherence to the biodynamic calendar ensures the vines receive the appropriate treatments at the appropriate times. Grapes are picked on fruit days, while the soil has been restored to the healthy, living microcosm it should be. In fact, every aspect of their winemaking style is distinct from modern oenology. They don't just abstain from chemical interventions, they actively avoid even harmless additions such as enzymes and tannin. Every grape is crushed by foot. Scattered across 40+ acres of rolling Tuscan hills, Cosimo Maria Masini grows both traditional Tuscan varietals and famed international varietals, as well as olive trees. Their property was under a vast sea 65 million years ago, and today many sea fossils are found mixed into their predominately clay soil. San Miniato, the small village they call home, is also the heart of Tuscan white truffle country. Annick is the Cosimo white that strikes the perfect balance between fresh and savory- the white that makes Bordeaux Blanc a little envious. Most of the juice is the 85% Sauvignon Blanc, pressed immediately and fermented at controlled temperatures. The remaining 15% is Vermentino, macerated on the skins for 4 days and fermented in concrete. The marriage yields a lovely golden wine, bursting with grassy and citrus notes, bushels of apples and hints of tropical flowers. Daphne is the white that thinks it's a red. The wine's 80% Trebbiano and 20% Malvasia grapes undergo 5 days of fermentation on the skins before being transferred to oak, where it finishes fermenting and ages for 10 months. The result is a deeply colored wine, with subtle fruit notes beneath the deep layers of herb and mineral. It's a rich wine that's just begging for some aged cheese and wild game. Without a doubt one of our top sellers, Sincero is indeed some happy Tuscan wine. A blend that's meant to be fresh and juicy, this could easily be served a touch chilled with your favorite easy dinner. Sangiovese, Cabernet Sauvignon and Cabernet Franc make up the blend, which ferments in concrete and then ages in very large wooden oak tanks. Cherry and red berry notes abound with subtle hints of flowers and herbs. 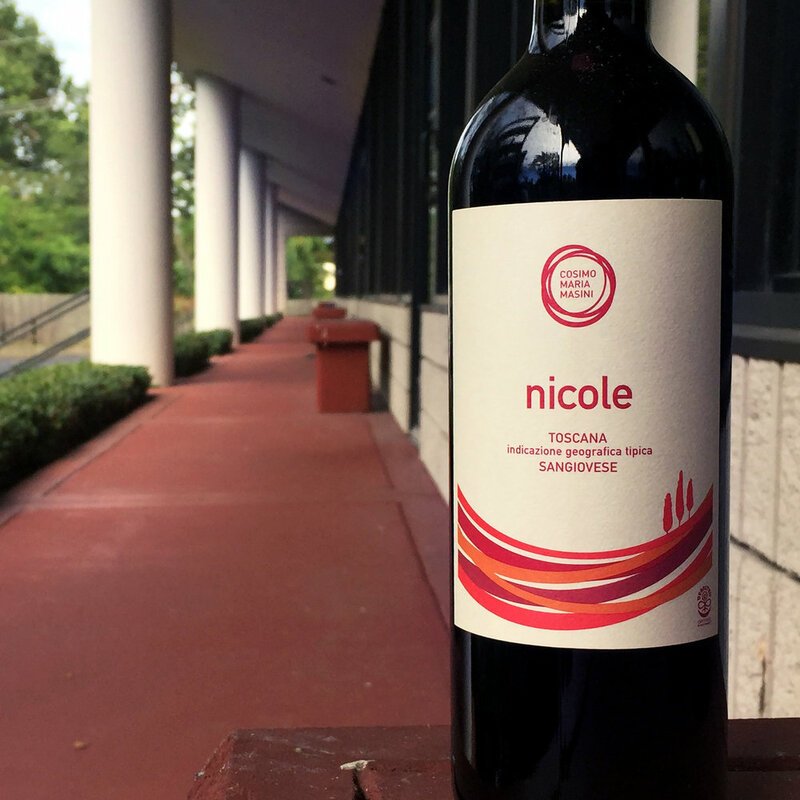 Although the best grapes go to another bottle, Nicole is Cosimo's best 100% Sangiovese. Grapes are selected from prime sites, south-east facing on the tops of the hills, from both young and old vines. The wine is fermented and aged in oak and achieves a character that's both bold and approachable. You should definitely invite Nicole to your pizza party.